Last week, I packed up my fiddle, guitar, bottle of Elijah Craig, selection of vinyl records, and KitchenAid mixer to head to Wingina, Virginia for our third annual Women’s Weekend. In Wingina. Yes. As always, it was a time of celebration, empowerment, music and merry making, and lots and lots of talking and eating. One of my contributions to the culinary spread was a layer cake. I must admit I messed up the steps in mixing the cake batter, which resulted in a slightly denser cake than I was aiming for. I’ll blame my mistakes on the fact that I was trying to sing harmony with the lovely Lorie while reading the recipe off my I-phone and operating the stand mixer, all at once. But the fluffiness of the meringue topping and delightful tartness of the lemon curd filling made up for it. Originally I wanted to make a pink strawberry cake with whipped cream because, Wingina. But I ended up cobbling this recipe together as several of us have dairy allergies or sensitivities. It uses butter, which was okay with everyone, and lots and lots of eggs, but no cream or milk. Plus, lemons seemed more seasonally appropriate, and I have always loved Lemon Meringue Pie (this is essentially the cake version). And I love that my mouth puckers even when thinking of lemons. Make this the day before you plan to bake the cake, or the morning of. 2. For the next step, you need to stir constantly. In a medium sized saucepan, cook over low heat until it looks smooth as the butter melts. Increase to medium heat, keep stirring. It takes about 15 minutes until it is thick and reaches about 170 degrees. Don’t let it boil. 3. Remove from heat and stir in the lemon zest. Pour into a mason jar and chill in the refrigerator. It will thicken more as it cools. 1. Preheat the oven to 325°F. Line two 9 inch cake pans with parchment paper or newspaper. 2. Sift the flour, 1 1/4 cups sugar, baking powder and salt together twice into a large bowl. 3. Using your mixer, beat the yolks, water, oil, zest and vanilla on high speed until smooth. Stir into the flour mixture until smooth. In another large bowl, or the bowl of your stand mixer, beat the egg whites with the cream of tartar until soft peaks are formed. Add the remaining 1/4 cup sugar, and beat on high speed until the peaks are stiff but not dry. 4. Use a rubber spatula to fold one-quarter of the egg whites into the egg yolk mixture, then fold in the remaining whites. Do so gently, only until the egg whites are no longer visible. Overdoing it will deflate the egg whites, and yield a denser, shorter cake. 5. Pour the batter into the cake pans and spread evenly. Bake them until the top springs back when lightly pressed and a toothpick inserted into the center comes out clean, about 40 to 50 minutes. Check every five minutes after the first thirty minutes. 6. Let cakes cool for at least an hour. When completely cool, run a knife around the sides to release, then flip out onto a plate. If the cake rises too much in the oven, after it is cooled, using a very sharp knife or a good serrated knife, cut off the domed top to make a flat surface. I secretly like doing this because I can taste the cake before everyone else. I looked up several recipes for a topping for the cake before deciding the one from this recipe. I was a little nervous about how it would turn out, but it got amazingly fluffy, light, and voluminous, and was really really easy! The egg whites as basically raw, so be sure to use non-factory farm eggs. I was unsure of how well this topping would hold up over time, as I assembled the cake a couple hours before it was served. It held up just fine for probably 4-5 hours. By the next morning when some of us wanted cake for breakfast, it looked slightly worse for wear-- not too bad, but a tiny bit deflated. Just keep this in mind – you can’t assemble this cake a whole day in advance. 1. Combine 2/3 cup sugar, 1/4 cup water, and dash of salt in a small saucepan over medium-high heat; bring to a boil, stirring just until sugar dissolves. Cook, without stirring, until a candy thermometer registers 240° (about 4 minutes). 3. Gradually pour the hot sugar syrup into the egg white mixture, beating first at medium speed and then at high speed until stiff peaks form. Beat in ½ teaspoon vanilla extract. 4. Assembling the cake: With the cake fully cooled, and topping and filling both ready, place one of your two layers on a plate or cake stand, and cut strips of parchment paper to put around it (this will make cleaning up topping that drips much easier). 5. 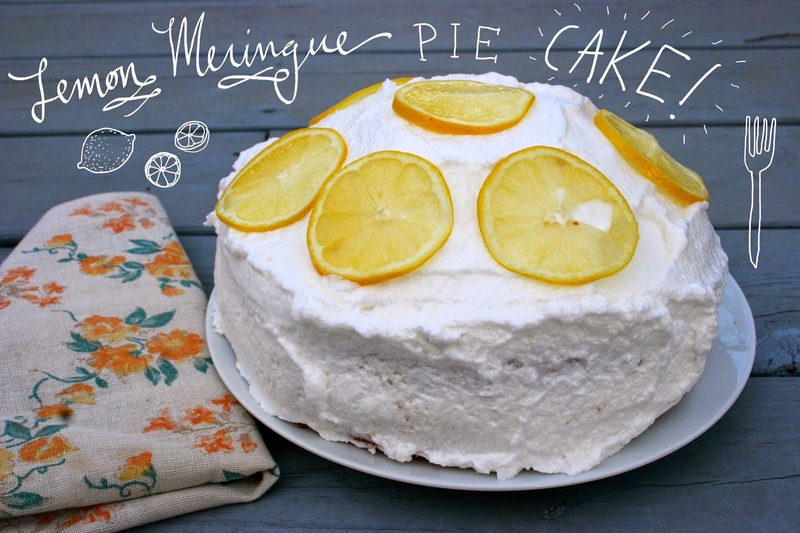 Fold about ½ a cup of the meringue into 1 cup of the lemon curd, and slather on the bottom cake layer using a spatula. Gently place the second cake layer on top, and cover with meringue. You can load the topping on pretty thick at the top if you want, I think mine was about 1 1/2 inches high at the center. Smooth with a spatula. Note: If you're the kind of person who has a pocket blow-torch, you can use it to brown the edges of the cake. Alas, I am sans blow torch. I wouldn't try putting it in the broiler-- that seems too risky for a cake (not to mention if it's on a cake stand! ), but it's fine fresh. I added thinly sliced a lemon to the top of the cake, which looked nice. You could sprinkle some lemon zest around if you prefer, or leave it bare. Enjoy! Oh my! Oh MY! I need a slice of this delicious pie!